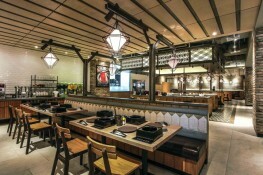 Large spaces are always a challenge when trying to design a restaurant interior with an intimate atmosphere. 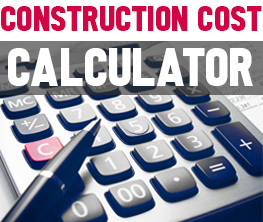 Add to this the need to balance an industrial environment, and you face a real test of creativity. A test that the designers of Framework Studio, an Amsterdam-based firm, passed with flying colors. 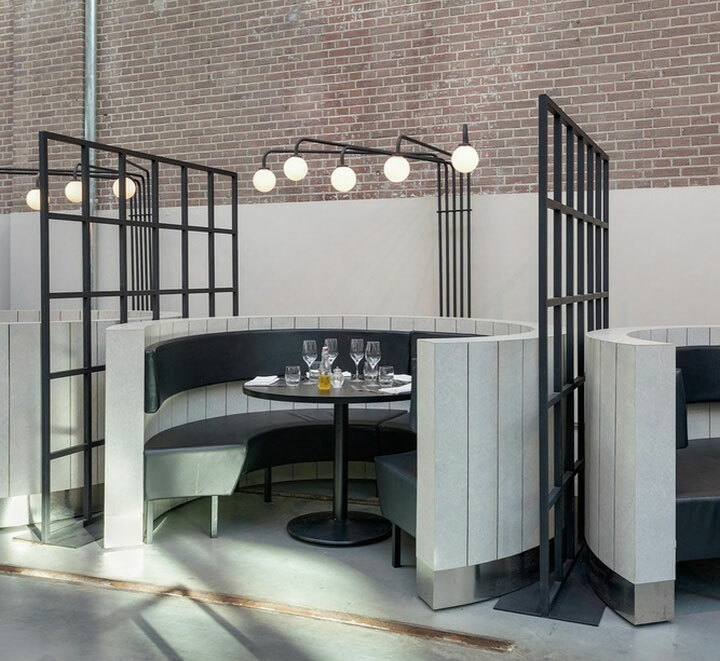 They created the interior of the Meat West restaurant in the Dutch capital, responding to both the need for an intimate dining space and the demand for an industrial interior. Drawing their inspiration from the ceiling and its intricate metallic structure, the designers imagined a coherent space in the same chromatic tonalities. The seating areas are created using partitions of geometric design that divide the space in sections, but do not block the view. The combination of curves and straight lines in the design of these seating areas brings visual variation into the mix. 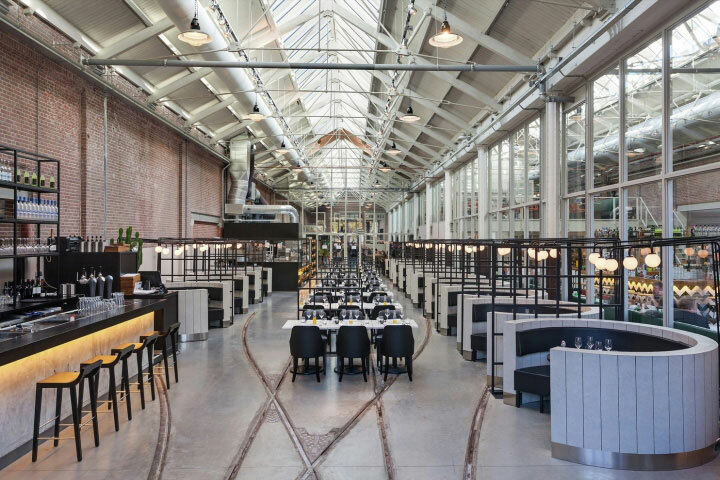 The rails preserve the industrial character of the space and offer an excellent opportunity for a uniquely patterned floor. Seen from a certain angle, the orderly placement of tables and chairs along these rails create the impression of a long line of wagon seats. 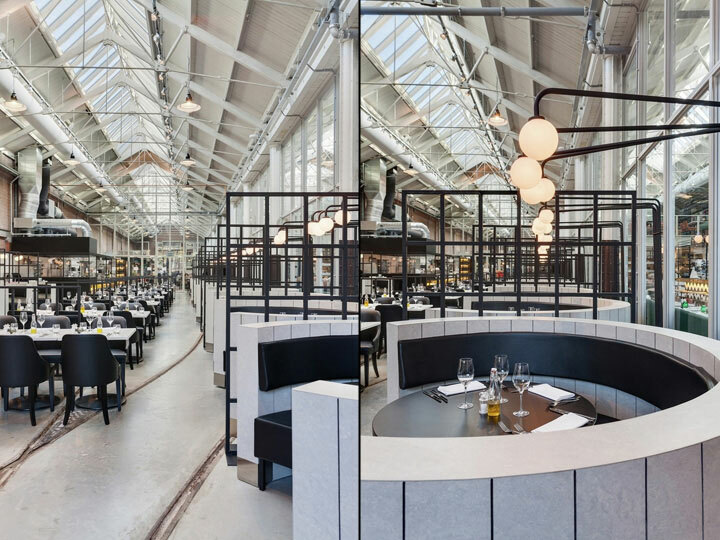 While remaining in the same chromatic register and opting for modern, sober lines, the upholstered chairs and benches add texture to a space dominated by steel structures. The lighting continues on the same geometric theme, with spherical shades climbing down from metal frames of minimalist construction. On one side, the bar area introduces another under-counter lighting element. 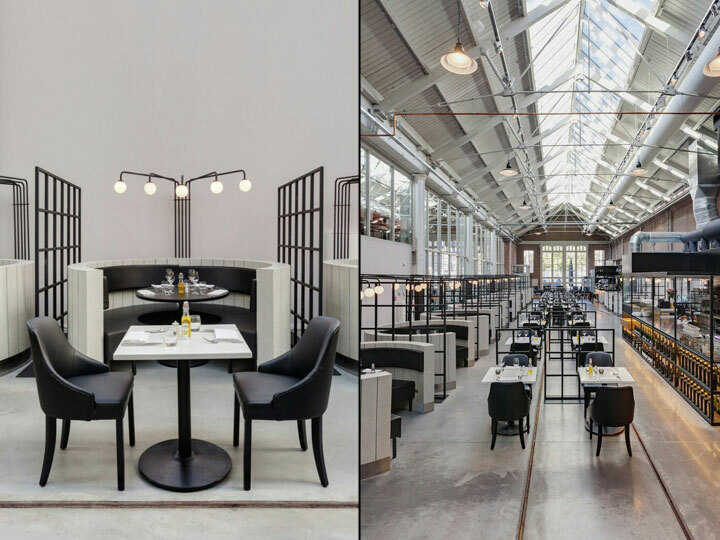 The Meat West restaurant combines a limited color register and geometric lines, yet offers its patrons the opportunity of an intimate dining experience in a highly original space.